Jonathan Browning, right, incoming CEO of Volkswagen Group of America, speaks at a news conference with Christian Klingler, left, VW's board member in charge of sales, at the National Press Club in Washington today. "Our task is to create an emotional connection with the U.S. consumer," Browning said of his appointment. WASHINGTON -- Jonathan Browning, the new head of Volkswagen AG's U.S. unit, vowed today to enhance dealer relations, generate sustained U.S. profits, and reconnect the brand once revered for the Microbus and Beetle with American consumers. Browning, a former General Motors and Ford Motor executive who joined VW in June, will take over on Oct. 1. He will become VW of America's fourth chief since 2005. He replaces Stefan Jacoby, who left to steer Volvo Cars. Browning said he would initially focus on several areas: ensuring a successful launch of the redesigned Jetta; improving customer satisfaction, dealer relations and the company's certified used-vehicle program; and producing sustained profits in the U.S. market over time. The introduction of the new Jetta will be followed by a new mid-size sedan designed to rival the Toyota Camry and Honda Accord in price, sales volume, and performance. The next-generation Beetle will follow the new mid-size sedan. Browning, 51, was initially hired by VW to improve coordination of the automaker's international sales companies. He was previously vice president of global sales, service and marketing at GM. His appointment ends a 2 1/2 month leadership vacuum and coincides with the final phase of the introduction of a new Jetta compact, VW's best-selling American model. VW is also preparing to open a factory in Tennessee to build the new mid-size sedan -- its first car built exclusively for the U.S. market. Browning reiterated today that VW hopes to be profitable in the United States by 2013. Browning said dealers will play a strategic, integral role in helping VW meet the sales and profit targets. He cited as an example Volkswagen's desire to get dealers to improve their used-car business. "They're fully aware of it," Browning said. "They're fully on board." "Volkswagen will play an even stronger role in the important U.S. market going forward," VW's sales chief Christian Klingler said before introducing Browning. "We used to be too cautious here in the United States. We are going on the offense." Klingler added that Browning "is an acknowledged expert on this market, its customers and its sales structures." The U.S. "will always be one of the largest and most important markets for automobiles," Klingler said. 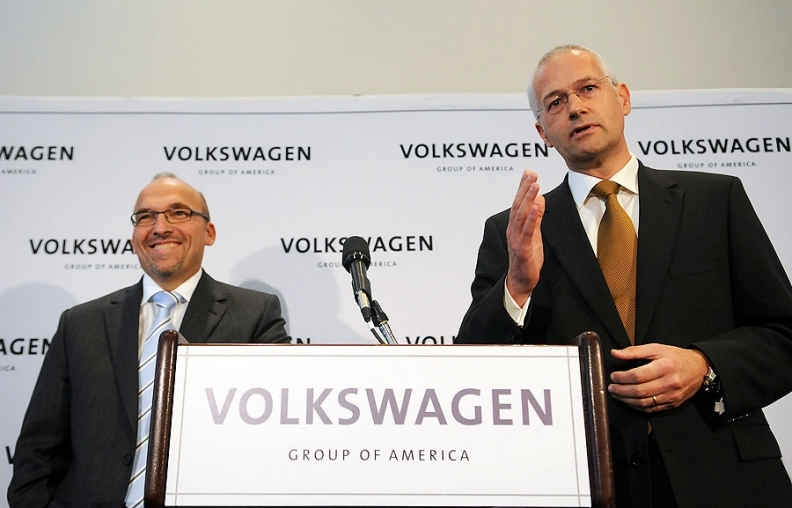 "Volkswagen and Audi will become leading brands in the USA ... It's not a dream. It's a plan." Browning, an Englishman, is a former chairman of GM's U.K.-based Vauxhall division and was the chief of Jaguar under Ford Motor Co. He worked for GM from 1981 to 1997 and returned in 2001 after his stint at Ford.